Edward- Shutter as puzzle: Hard work pays off!!! I was rushing for the christmas campaign for a prestigious shopping mall in Hong Kong, Pacific Place. It was lots of work(off work around 12-1:30 am last week)!! I was working on the multimedia stuff and suffering with bugs and it nervous client quite a lot (me too). At the end, it works out pretty good and wish you guys enjoy it!! Thx for my collages for all the hard work and pull it off ! 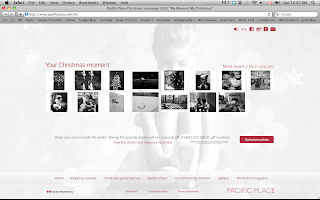 Please visit the website and post your and vote your favourite Christmas moment!! It has both desktop and mobile verstion, enjoy.